This delightful self-drive tour is planned with daily activities, and focuses on alluring towns and magnificent natural surroundings. Activities can be changed according to your wishes. The itinerary will provide new angles to this journey, and Spain is More researchers know the best operators to maximize this sensational tour. The varied landscape in Northern Spain furnishes a wide range of exciting, fun, fascinating and perhaps even untested activities. Combined with Northern Spain’s fabulous cuisine, good wines, cultural experiences and lush panoramic countryside, this vacation becomes unique and unforgettable. The trip turns deep into the Picos de Europa-mountains to a fantastic rustic hotel surrounded by mountain peaks. Cave Gorge is a really awesome experience: you get deep into huge caves where you will be able to explore much further than a normal tourist would and beyond paths, light and dryness. You will be wearing a wet suit and will be provided with head torch while a special educated guide follows you through the underground river. You will find it sometimes necessary to fully rely on each other and jump straight into the darkness. There are typically a little rappelling and climbing in this discipline. This unique experience exists in few places around the world. On your trip to the mountain-hotel, fantastic rock formations rise high and impressive on both sides of the road and parallel the river. 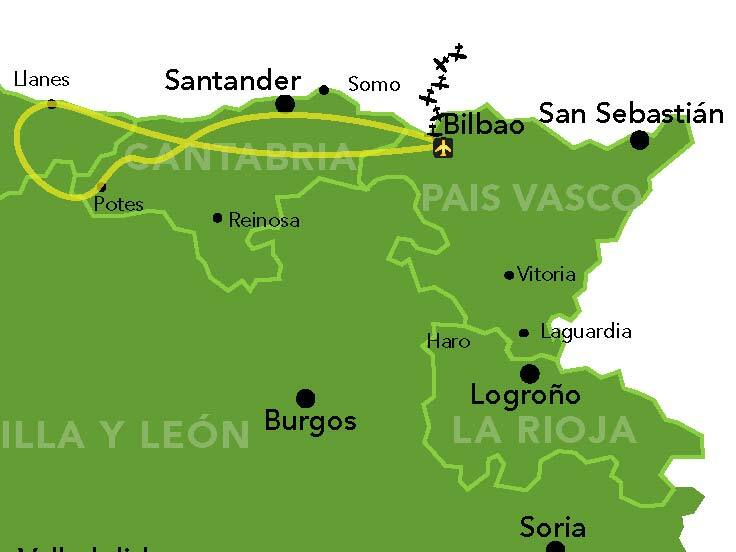 Embark on one of the most famous and majestic hiking routes in Spain on the way to the hotel. The route cuts to the center of this wonderful mountain chain and ends in a lush valley, surrounded by high peaks, idyllic villages and a wonderful country kitchen. The hotel is an ideal base from which to visit attractions and explore exciting adventures. The next day its time for the second activity, which is always a favorite among our guests, canyoing. Canyoning (Barrancos) is a fun and different experience for everyone in the family. The beautiful mountains and streams are crossed using various methods and you will try both rappelling, climbing and gliding through streams and rivers. A mixture of many fun mountain activities, which is always a big hit among our guests - youngsters as well as older. The trip can be arranged so that people at different levels easily can be challenged even on the same group. An enthusiastic guide, who will be giving you a joyful experience, will follow you around the terrain. This activity can also be tested at night, when the experience is obviously different and somewhat more difficult (level 2-3). There are also several possibilities for hiking in the valley including taking a cable car to the mountain heights on a breathtaking journey. From the top there are many hiking tours for all levels. The trips turns back to the green and vigorous coast. You will stay in one of the most cozy and beautiful villages along the coast, Llanes. Among the forests, idyllic fishing towns and large rock formations one can find some of the best beaches in Spain. Spain is More will expertly guide you through interesting and varied sightseeing locations. Because of the proximity to the mountains, the trip includes either canoeing or kayaking at a picturesque river. A canoe trip is a classic activity that is always exciting and enjoyable for both children and adults. It is an excellent opportunity to get off the road. Bringing the lunch and enjoying the scenery and tranquillity on the journey through valleys and woods on quiet rivers, is a very joyful experience. As a normal rule, the trip does not comprise a guide, but it does include pickup and driving back after the trip. Please note that July and August are high-season, so the place can be crowded and be less peaceful than it is during other months of the year. The Northern Spain waves are famous, and during this 2 hours surf course you will try surfing at your own level. The Spanish coast is a paradise for surfers. Surf-people from around the whole world travel here when the season is approaching to feel the thrill of the perfect waves. Some of the beaches are legendary surf beaches and we can create courses for all tastes and for any level. Instructors are normally from other countries, as they stay as "surf bums" by earning a bit as surf instructors However, they are passionate about it and that way you get a glimpse to the authentic surf culture. If you want to go for a high-level course the challenge will of course depend on the weather and the wind. 4 multi-adventure activities (Caving, Barrancos, Surf y Canoe/Kayak)*. Spain is More guidebook in English with recommendations, itinerary, guides, maps, directions etc. (only one per group of 4).